The sophisticated piano-sized spacecraft, which launched in January 2006, reached Neptune’s orbit --nearly 2.75 billion miles from Earth -- in a record eight years and eight months. New Horizons’ milestone matches precisely the 25th anniversary of the historic encounter of NASA’s Voyager 2 spacecraft with Neptune on Aug. 25, 1989. New Horizons now is about 2.48 billion miles from Neptune -- nearly 27 times the distance between the Earth and our sun -- as it crosses the giant planet’s orbit at 10:04 p.m. EDT Monday. Although the spacecraft will be much farther from the planet than Voyager 2’s closest approach, New Horizons' telescopic camera was able to obtain long-distance “approach” shots of Neptune on July 10. “NASA’s Voyager 1 and 2 explored the entire middle zone of the solar system where the giant planets orbit,” said Alan Stern, New Horizons principal investigator at the Southwest Research Institute in Boulder, Colorado. “Now we stand on Voyager’s broad shoulders to explore the even more distant and mysterious Pluto system. 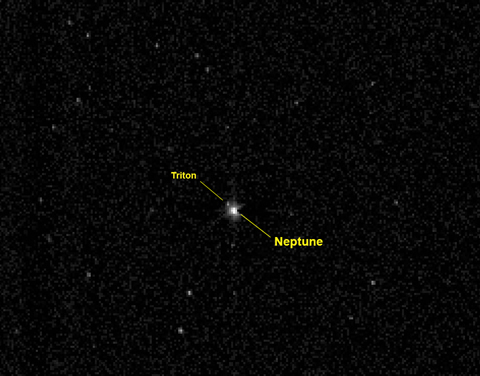 Distant Neptune: The New Horizons spacecraft captured this view of the giant planet Neptune and its large moon Triton on July 10, 2014, from a distance of about 2.45 billion miles (3.96 billion kilometers) - more than 26 times the distance between the Earth and sun. 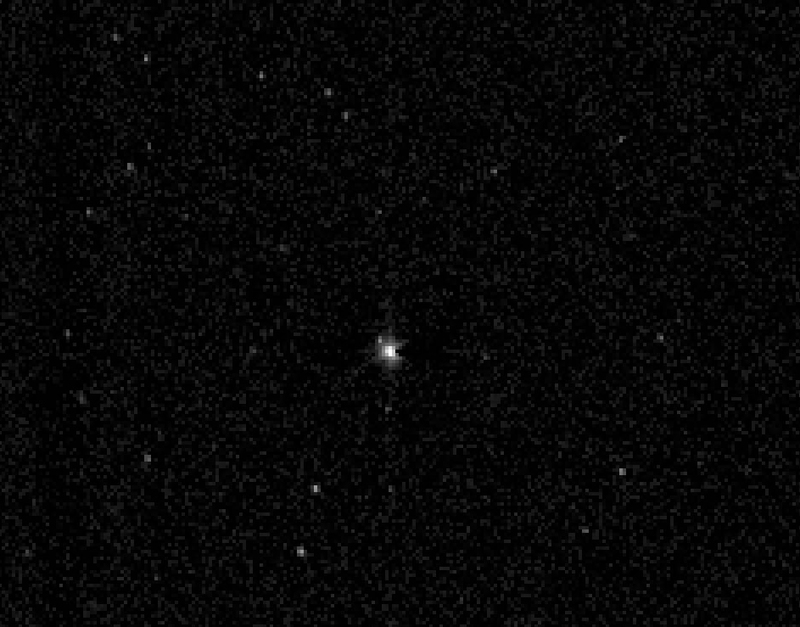 The 967-millisecond exposure was taken with the New Horizons telescopic Long-Range Reconnaissance Imager (LORRI). 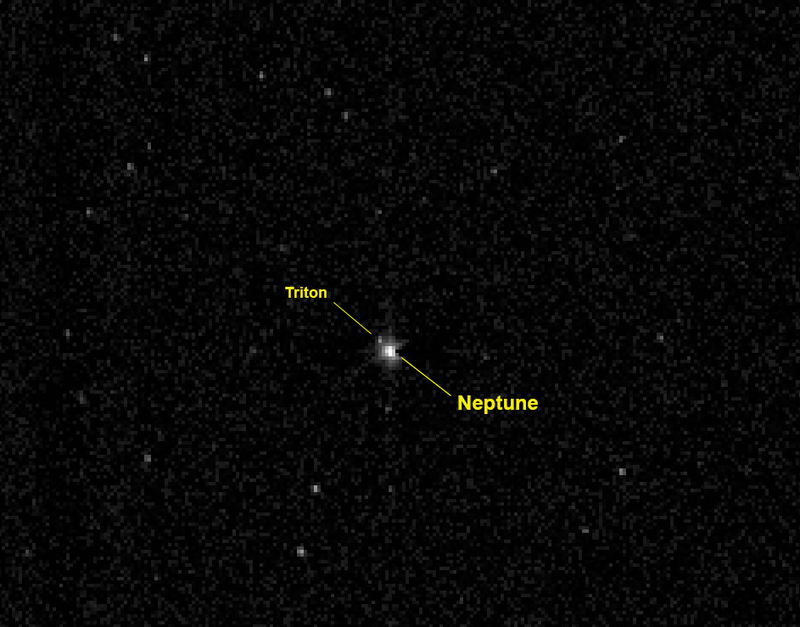 New Horizons traverses the orbit of Neptune on Aug. 25, 2014 – its last planetary orbit crossing before beginning an encounter with Pluto in January 2015. In fact, at the time of the orbit crossing, New Horizons was much closer to its target planet – just about 273 million miles (or 440 million kilometers) – than to Neptune. Click for a non-annotated version. Many researchers feel the 1989 Neptune flyby – Voyager’s final planetary encounter – might have offered a preview of what’s to come next summer. Scientists suggest that Triton, with its icy surface, bright poles, varied terrain and cryo-volcanos, is a Pluto-like object that Neptune pulled into orbit. Scientists recently restored Voyager’s footage of Triton and used it to construct the best global color map of that strange moon yet – further whetting appetites for a Pluto close-up. Similar to Voyager 1 and 2's historic observations, New Horizons also is on a path toward potential discoveries in the Kuiper Belt, which is a disc-shaped region of icy objects past the orbit of Neptune, and other unexplored realms of the outer solar system and beyond. New Horizons is the first mission in NASA’s New Frontiers program. APL manages the mission for NASA’s Science Mission Directorate at NASA Headquarters. APL also built and operates the New Horizons spacecraft. The Voyager spacecraft were built and continue to be operated by NASA's Jet Propulsion Laboratory (JPL) in Pasadena, California. The Voyager missions are part of NASA's Heliophysics System Observatory, sponsored by the Heliophysics Division of the Science Mission Directorate.